Stepping waaaaaay out of mama's comfort zone, here. Hi. My name is Ali; I'm 39 years old, and a mom to a beautiful baby boy. Being a mom is a lot of fun, especially right now. My son is 15 months old and is at a stage where everything he sees is the most interesting thing in the world. He makes me laugh until I cry, and he gives the best snuggles. 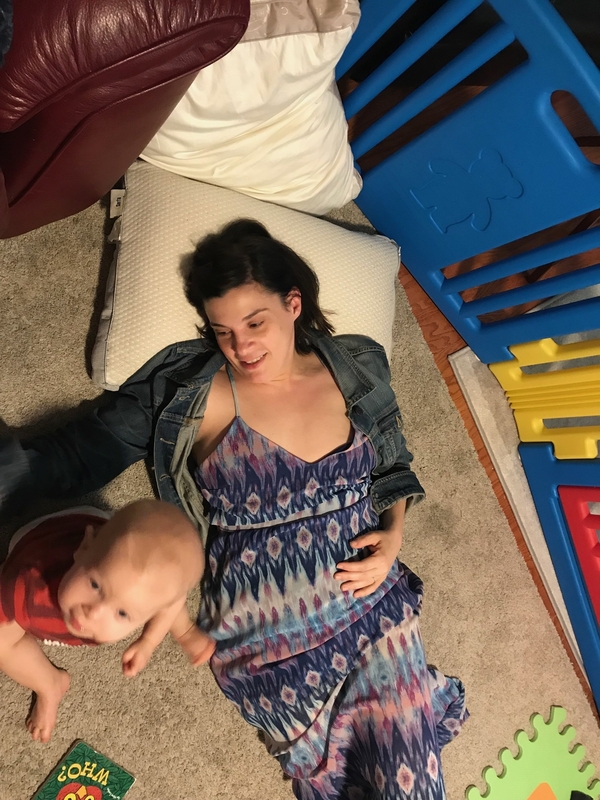 This stage also means that I spend a lot of time on the floor with a very active toddler and not a whole lot of time gets devoted to sleeping, thinking about what I'm wearing, or grooming. Blow drying my hair is a luxury, and makeup is reserved for the rare date night when we can actually book a babysitter and make it out of the house. So when I was invited to participate in a video wearing some pieces from Savage X Fenty's size-inclusive lingerie line, I was...unsure. To illustrate how far out of my comfort zone prancing around in skimpy lingerie would be, let me give you some perspective. My baby is over a year old and I'm still wearing maternity jeans to work. And to run errands. And to the movies with my husband. In the end, I decided to go for it, because I felt like I wanted and needed to get back in touch with the woman I was before my identity was wrapped up in being my son's mother. The day of the shoot started with me spending some quality time getting my hair and makeup done. Sitting in that chair and having someone put makeup on me and do my hair was like taking a spa vacation. It was a really nice change of pace to just sit there, breathe, and let the fabulous Rebecca Lee Castro do her thing. *I will say that while the false eyelashes looked AMAZING, they felt incredibly heavy and a little itchy on my eyelids. But it was worth it. Standing in front of a camera crew — including a couple of guys I've never met —was a little intimidating to say the least. This teddy was not the most comfortable thing to wear in the first place, but wearing it in front of people and cameras was making me sweat. I was directed to have some fun and sort of let go of my inhibitions and move around a bit, which at first was awkward AF. But there was some Rihanna pumping through the speakers, and I caught a glimpse of myself in the monitor and you know what? I looked pretty freaking GOOD. You guys, I was really feeling myself. Here's the thing: Standing (and dancing) in a lacy corset in front of a bunch of strangers, knowing the entire thing would be seen by a lot MORE strangers on the internet is way out of my comfort zone. BUT it was also liberating AF. Once I shook off the metaphorical cobwebs, I was able to remember who I was in my fearless twenties and confident early thirties. My outsides have changed a bit since those days, but I'm still the same woman who was a karaoke superstar even though I can't carry a tune and I'm still the same woman who traveled across the world alone for spontaneous, romantic adventures. She's still there and she's a better person and a better mom because of those experiences. So, now that I was enjoying my newly found confidence, it was time to slip into my second look, a red bra and underwear. So, this t-shirt bra from the Savage X Fenty collection was actually REALLY comfortable. Like, I could sleep in it. Also, it was nice to wear a bra that actually fit well. In addition to my maternity jeans, I'm also still wearing my old nursing bra on a daily basis. My breasts have changed size and shape so much after pregnancy, birth, and breastfeeding, and I haven't had the time/energy to shop for a bra that fits my new body. Also, I was actually in a lot of pain thanks to the fact that I pulled a muscle in my neck that morning by simply blow drying my hair. Because apparently I'm old and brittle. But somehow, all of that sorcery turned into another amazing transformation. With my 40th birthday just around the corner, it was really empowering for me to let go of some of my inhibitions and anxieties that come with becoming a mother and approaching a whole new age bracket. I generally have a hard time looking at photos and video of myself, but to be honest I'm really proud of these photos. I know my body has changed a lot and will continue to do so, and I'm okay with it all. This experience made me feel powerful, vibrant, and unlimited. Mama's gonna be just fine, y'all.